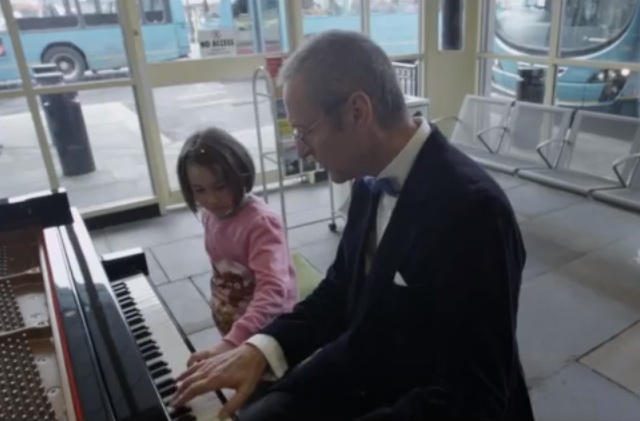 Pianist Andy Jackson leads a young musician in Beethoven’s Moonlight Sonata at Haymarket Bus Terminal. Photo courtesy of Arts Council England. Commuting can be arduous, whether you are one of those souls stuck in traffic, on a bus, or in a train after that second underground transfer -or for that matter, when you are 20 minutes away in the wrong way direction and are now in Virginia. In big cities with bus and rail stations everywhere, we are graced, and occasionally accosted, with musicians’ public tunes. From O Tannenbaum around the first snow, to Auld Lang Syne abutting New Year’s to the 14 year old gracing us with her new found “talents” on the violin, playing a halting Greensleeves, we are an audience en route. Sometimes we are even graced with Jessie’s Girl. But for those en route to or fro their daily grind in Northern England, the ire of red lights were quenched by Moonlight Sonata. In Newcastle, England, famous for its Shore , for its ale , and the universal affectation, “pet”, commuter piano duets will now enter the local lore as pride for the city. Geordies passing through Haymarket Bus Terminal took a step aside from their daily commutes and accompanied pianist Andy Jackson on a baby-grand this past week. Some contributed a note (or two or three) toward the the full suite of Beethoven’s famous opus, gently guided by il maestro. Many of the participants in this Art on Transport project had never even touched a piano before. Bravo, Newcastle. Bravo! Across the North Sea, at Stockholm’s Odenplan Tunnelbana station, transit and pianos interacted on a larger scale…and with feet. In a Volkswagen sponsored initiative to incentivize healthy behavior, a team turned station steps into a walkable piano. These mega sized piano keys, reminiscent of 1980’s pop culture fitted with sensors and speakers, created a foot activated few octaves as pedestrians scaled the stairwell. The station “keys” (read, steps) had more than just notes escalate during the experiment: walkers chose the piano stairwell 66-percent more than its placid neighbor, the station escalator. Young and old, pianissimo and forte, celebrated excercise and interaction with what was otherwise just another leg of the daily commute.